While many have heard of it, few know very much about it. Yet acupuncture is one of the oldest healing arts in the world, practiced centuries ago by ancient Chinese as a method of curing a host of ailments. Today, Americans make as many as 12 million visits per year to acupuncture practitioners, according to the most recent statistics from the Food and Drug Administration. Many people who have experienced acupuncture report relief from pain and a sense of euphoria or well being. There are currently more than 10,000 certified acupuncturists, one-third of them physicians practicing in this country. Acupuncture involves the application of extremely fine needles into one or more of the 2,000 acupuncture points on the human body. These points are said to link 12 main and 8 secondary pathways. These channels, or pathways, are called ‚Ã„Ãºmeridians." The meridians are believed to conduct energy between the body's skin and internal organs. Part of the controversy surrounding acupuncture stems from the fact that scientists cannot correlate the 20 pathways, or meridians, with the human body's blood circulation and nerve paths. Nevertheless, acupuncture theory holds that energy conducted by meridians, also called qi (pronounced "chee"), is known to coordinate the balance between one's spiritual, emotional, mental, and physical state. Acupuncture is believed to help in balancing the opposing forces called yin and yang. A healthy person's yin and yang are said to be in a state of harmony. Acupuncture has about as many critics as it does advocates. Medical researchers have shown in dozens of high profile studies, however, that acupuncture can be an effective alternate treatment for a myriad of health problemsfrom central nervous system-related conditions and immune system response. Acupuncture is known to have a profound impact on pain. The theory is that the application of fine needles in acupuncture points stimulates the release of chemicals, such as endorphins or opiates, which dull or alleviate pain while releasing hormones, neurotransmitters, and other chemicals that aid in healing or regulating things, such as blood pressure. Evidence has shown that the body's 2,000-plus acupuncture points do conduct electricity, and this flow of current may play a role in triggering the release of helpful chemicals in the body to where they are needed most. Acupuncture needles are so incredibly small and thin (up to 50 times thinner than a standard hypodermic needle), they are barely noticeable when inserted. Some people who experience acupuncture report feeling nothing at all; others report feeling a mild discomfort, followed by a mild sensation of cramping, tingling, numbness, warmth, or heaviness. 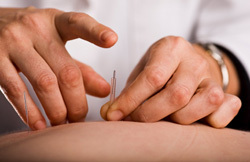 Acupuncture needles are normally left in place for 20 to 40 minutes. Acupressure, another alternative therapy rooted in ancient Eastern medicine, involves exerting pressure on specific body points by use of the fingers of the hand, palm, or elbows.